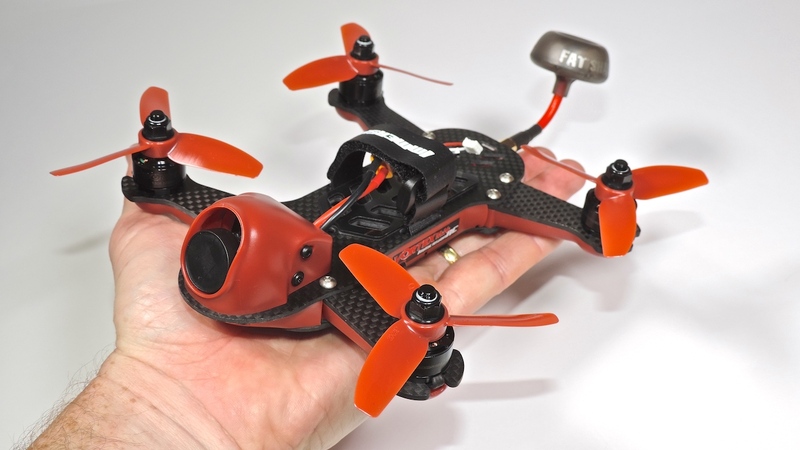 This Vortex 150 review was originally written for RC Flight Camera Action, before it went under. See my previous entry on the Taranis QX7 review for more details on this. 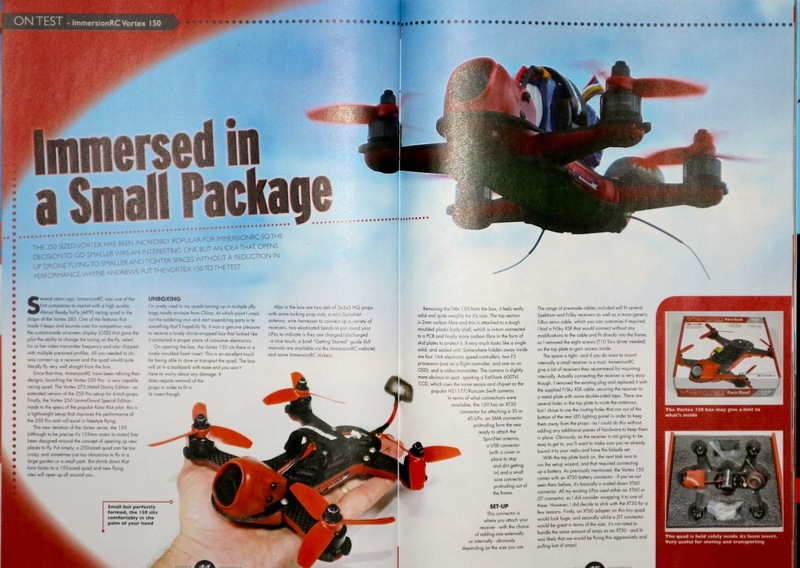 As it had been sent to me by ImmersionRC to use in the magazine, this was a slight pain that this took so long after I wrote it to appear, and was on it’s 3rd magazine by the time it actually appeared. 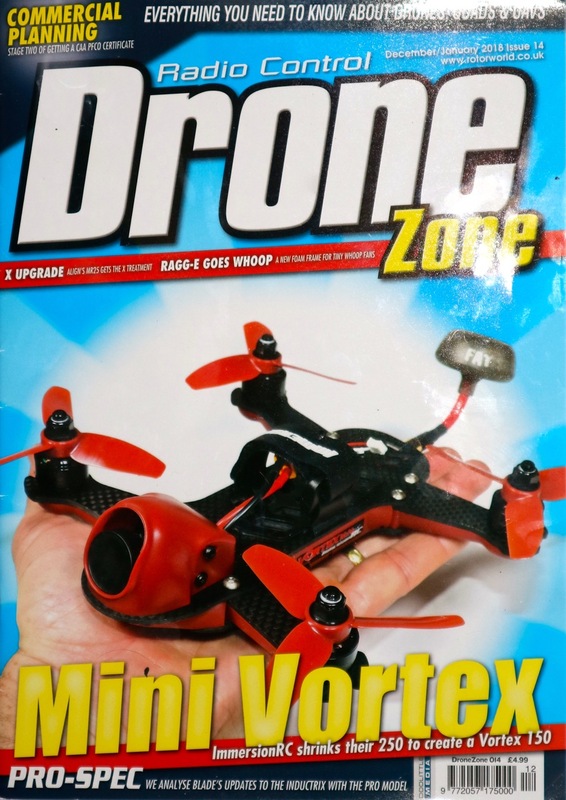 It did appear on the front cover of Dronezone though, so a result there. As a blog entry, it’s probably a bit picture heavy. This nice thing about writing for magazines, is that you write the words, take a bunch of pictures and then a designer handles the layout – and in this case flowed the words around the pictures very well. I should also mention the idea of a “boxout”. A boxout is piece of boxed text in a magazine, sort of a little side self-contained story the fits in. I can’t draw a box in a blog. In this case the product specs were part of a box out, so I’ve just highlighted them. 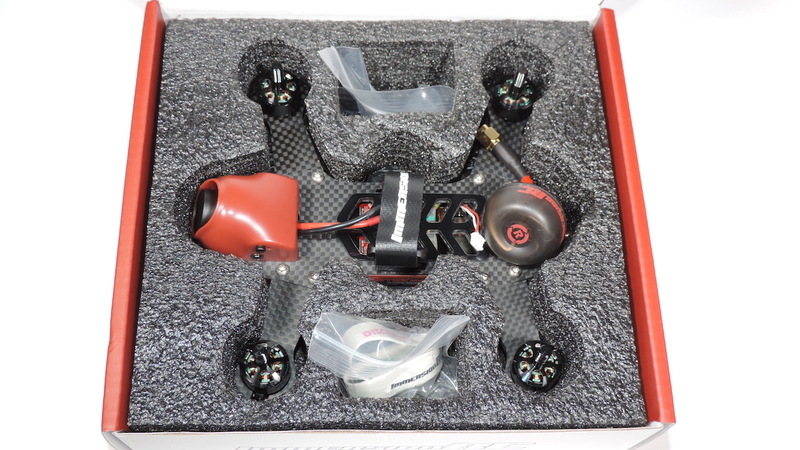 Several years ago, ImmersionRC was one of the first companies to market with a high quality ARTF racing quad in the shape of the Vortex 285. 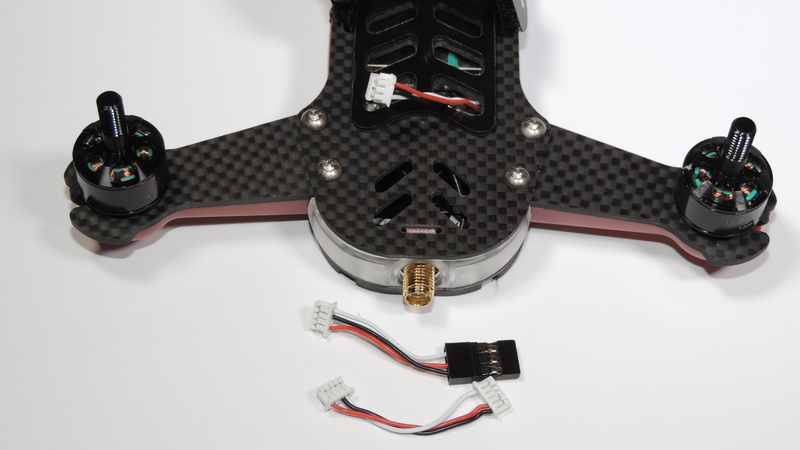 One of the features that made it leaps and bounds over the competition was the custom-made OSD which gave the pilot the ability to change his tuning on the fly, select his VTX frequency and also shipped with multiple pre-tuned profiles. All you needed to do was connect up a receiver and the quad would quite literally fly very well straight from the box. 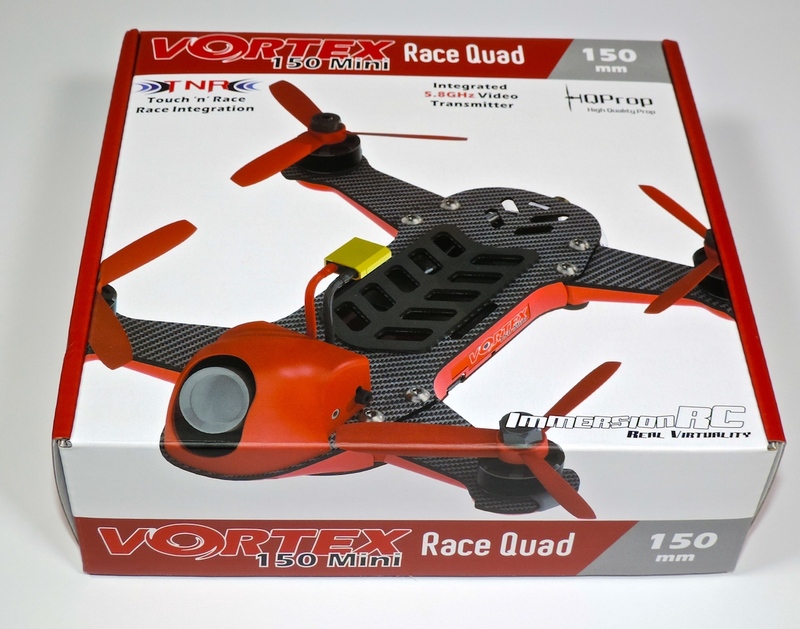 Since that time, ImmersionRC have been refining their designs; launching the Vortex 250 Pro – a very capable racing quad. 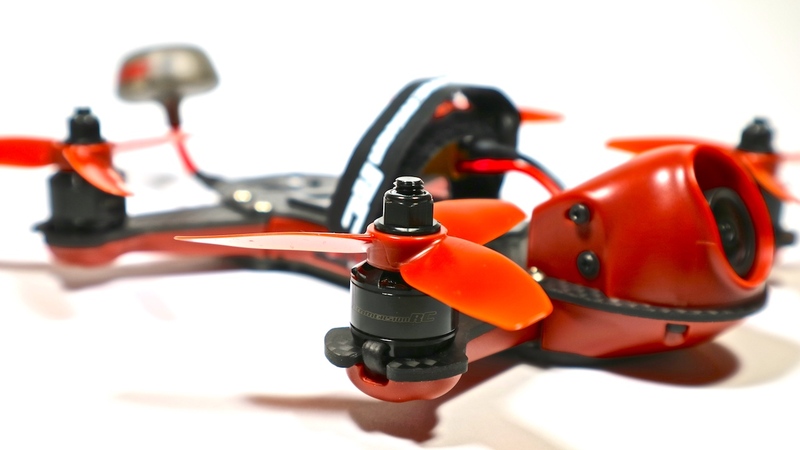 The Vortex 275 Metall Danny Edition – an extended version of the 250 Pro setup for 6” props. 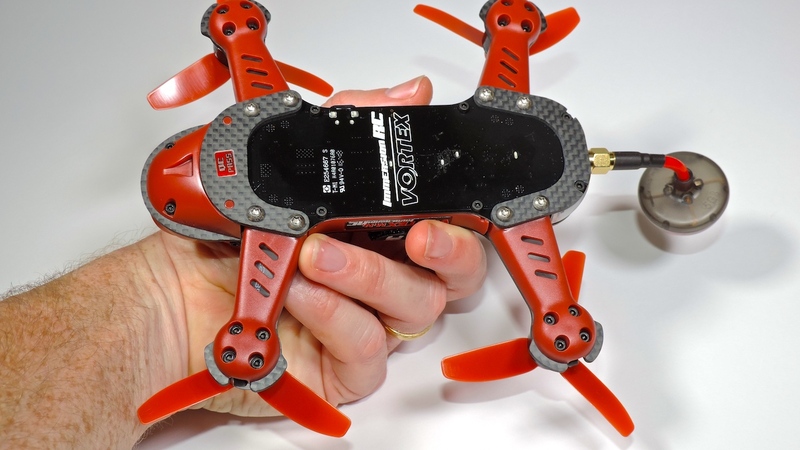 Finally, the Vortex 250 UmmaGawd Special Edition – made to the specs of the popular RotorRiot pilot, this is a lightweight setup that improves the performance of the 250 Pro and will excel in freestyle flying. This new iteration of the Vortex series, the 150 (although to be precise it’s 155mm motor to motor) has been designed around the concept of opening up new places to fly. 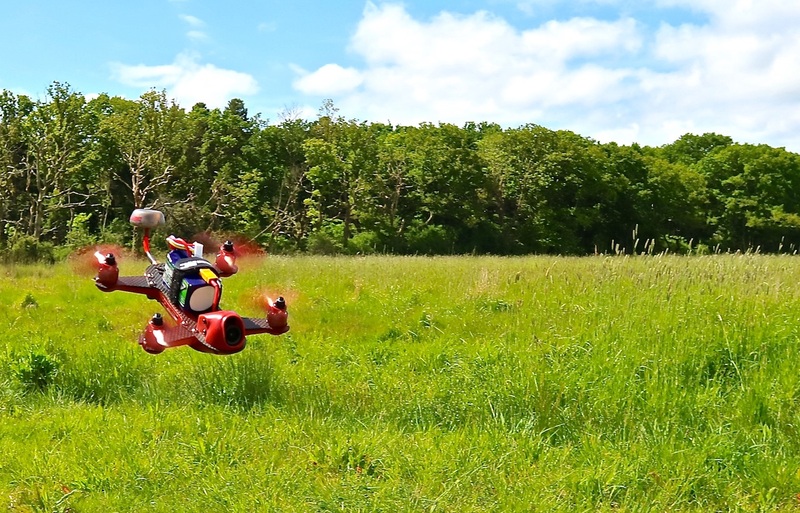 Put simply, a 250-sized quad can be too crazy, and sometimes just too obnoxious to fly in a large garden, or a small park. But shrink down that form factor to a 150 sized quad and new flying sites will open up all around you. I’m pretty used to my quads turning up in multiple jiffy bags mostly en-route from China. At which point I crack out the soldering iron and start assembling parts in to something that’ll hopefully fly. It was a genuine pleasure to receive a lovely shrink wrapped box that looked like it contained a proper piece of consumer electronics. On opening the box, the Vortex 150 sits there in a nicely moulded foam insert. This is an excellent touch for being able to store or transport the quad. The box will sit in a backpack with ease and you won’t have to worry about any damage. It does require removal of the props in order to fit in it’s insert though. Also in the box are 2 sets of 3x3x3 HQ props with some locking prop nuts, a mini SpiroNet antenna, wire harnesses to connect up a variety of receivers, two elasticated bands to put round your lipos to indicate is they are charged/discharged – a nice touch, a brief “Getting Started” guide (full manuals are available via the ImmersionRC web site) and some ImmersionRC stickers. Removing the little 150 from the box, it feels really solid and quite weighty for it’s size. The top section is 2mm carbon fibre. This is is attached to a tough moulded plastic body shell, which is in-turn connected to a PCB and finally more carbon fibre in the form of skid plates to protect it. It very much looks like a single solid, and sealed unit. Somewhere hidden away inside are four 16A ESCs, two F3 processors (one as a flight controller, and one as an OSD), and a VTX. 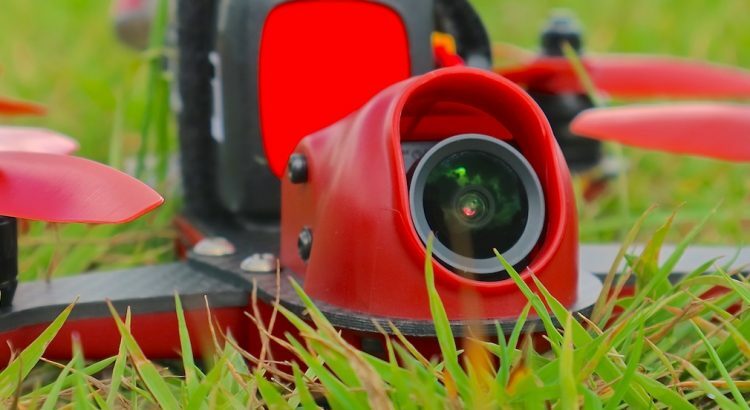 The camera is slightly more obvious to spot – sporting a Fatshark 600TVL CCD, which uses the same sensor and chipset as the popular HS1177/Runcam Swift cameras. In terms of what connections were available, the 150 has an XT30 connector for attaching a 3s or 4s lipo, an SMA connector protruding form the rear ready to attach the SpiroNet antenna, a USB connector (with a cover in place to stop and dirt getting in) and a small wire connector protruding out of the frame. 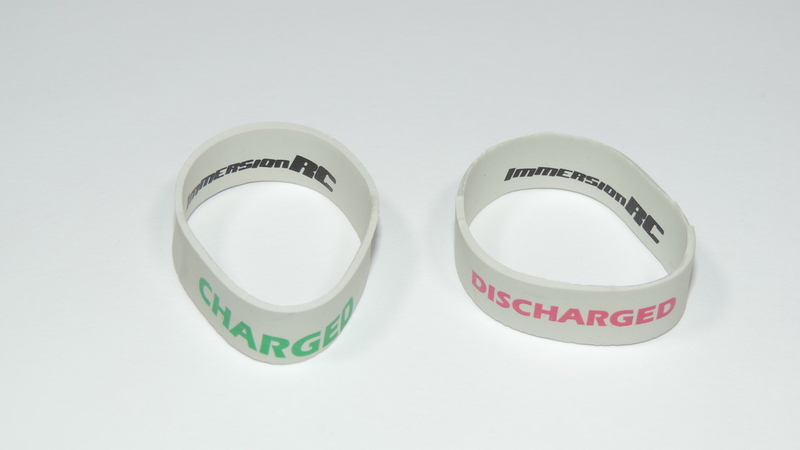 This connector is where you attach your receiver – with the choice of adding one externally or internally – obviously depending on the size you use. The range of pre-made cables included will fit several Spectrum and FrSky receivers as well as a more generic SBUS servo cable which you can customise if required. I had a FrSky XSR which would connect without any modifications to the cable and fit directly into the frame, so I removed the 8 screws (T10 Torx driver needed) on the top plate to gain access inside. The space is tight – and if you do want to mount internally a small receiver is a must. ImmersionRC give a list of receivers they recommend for mounting internally. Actually connecting the receiver is very easy though. I removed the existing plug and replaced it with the supplied FrSky XSR cable, securing the receiver to a metal plate with some double sided tape. There are several holes in the top plate to route the antennas, but I chose to use the routing holes that ran out of the bottom of the rear LED lighting panel in order to keep them away from the props – as I could do this without adding any additional pieces of hardware to keep them in place. Obviously, as the receiver is not going to be easy to get to, you’ll want to make sure you’ve already bound it to your radio and have the failsafe set. With the top plate back on, the next task was to run the setup wizard, and that required connecting up a battery. As previously mentioned, the Vortex 150 comes with an XT30 battery connector – if you’ve not seen them before, it’s basically a scaled down XT60 connector. 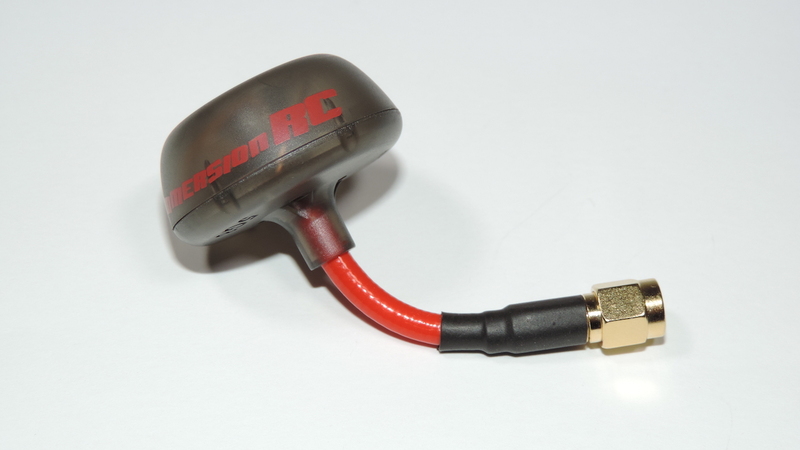 All my existing lipos used either an XT60 or jst connector, so I did consider swapping it to one of these. However, I did decide to stick with the XT30 for a few reasons. Firstly, an XT60 adapter on this tiny quad would look huge, and secondly whilst a JST connector would be great in terms of the size, it’s not rated to handle the same amount of amps as an XT30 – and lit was likely that we would be flying this aggressively and pulling lost of amps! I would normally use velcro on all my quads (loop part on lipos, hook part on quad plates), but the Vortex 150 has it’s own battery plate, which while not sticky to the touch, creates such friction when you put a battery onto it that velcro is not needed. What is important to consider though, is the lack of space you have between the props and the battery. Tucking the power and balance leads into the strap is a must if you don’t want them severed by the props. The underside of the 150 reveals the tough plastic moulded parts and the additional carbon fibre skid plates. The Vortex 150 Wizard is a very slick configuration tool. 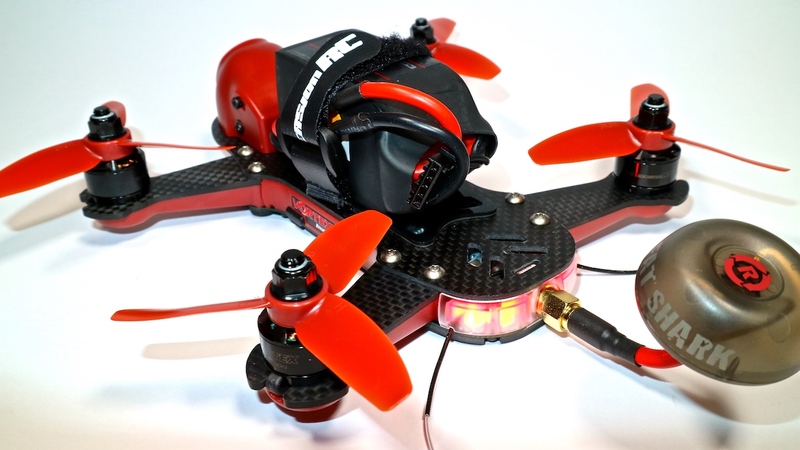 Tune your goggles to 5.740Ghz (Otherwise known as FatShark/ImmersionRC 1, or F1) and power up the quad. The wizard will detect the type of receiver installed, and then ask you to move the sticks to the extents one-by-one. At this point, it’s ready to fly, and my Vortex 150 surprised me by playing the theme from Super Mario Brothers to celebrate this fact ! By default, the quad arms via a stick command and has three flight modes setup: Acro, Horizon, and Angle. I connected the 150 up to Betaflight in order to put my normal modes config in: Arming and Air mode with Aux2 and Acro/Horizon and Beeper via Aux1. This is where small changes became apparent – although the 150 runs Betaflight, it’s own software interfaces with it and does some things it’s own way. 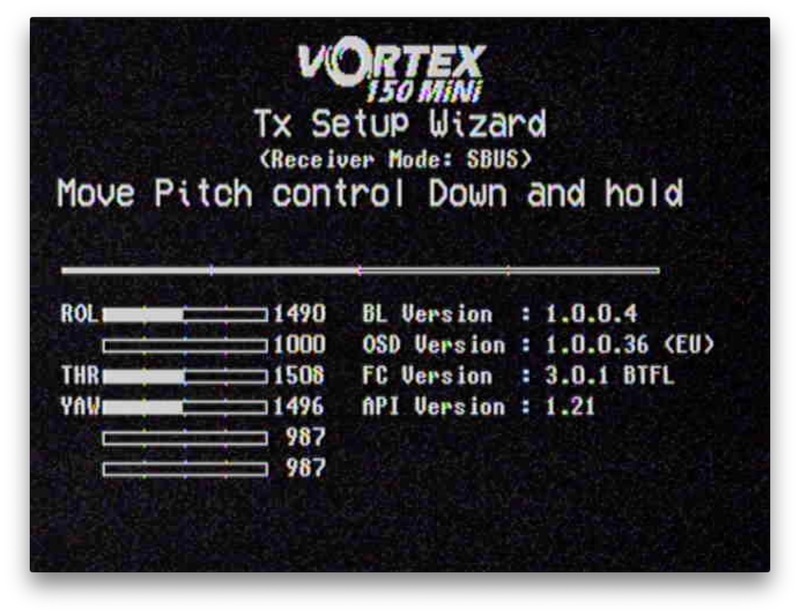 One of these things was the beeper – the Vortex sounds it’s lost model beeper when it’s disarmed – it’s not controlled via Betaflight. This tightly coupled relationship between the two pieces of software means that it’s not recommended to simply go and install the latest version of Betaflight, just in case changes in the API mean that the Vortex won’t be able to talk to it in the same way. 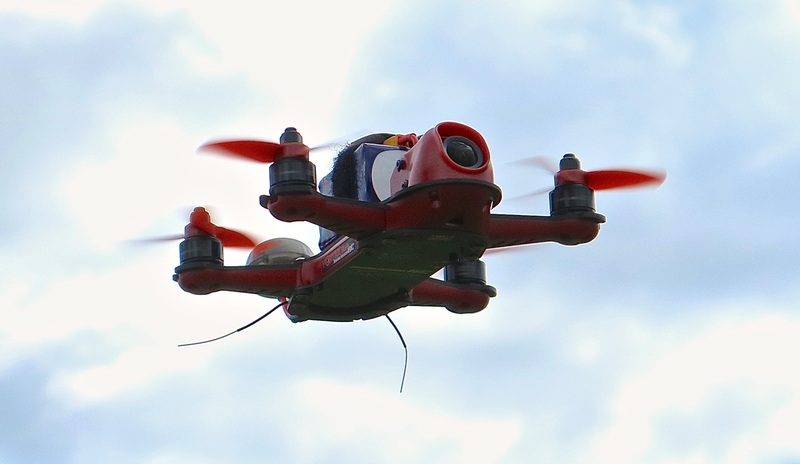 The best place to get the latest updates is via ImmersionRC’s website where they bundle the Vortex 150 Firmware together with an appropriate Betaflight release which you flash to the Vortex with their own Chrome application. When I checked the website, they had the latest Betaflight 3.1.7 version available. Upgrading means that it will rerun the wizard and restore default settings, so back these up in Betaflight before hand and restore afterwards. I had a quick LOS hover in the garden just to check everything looked ok before heading over to my local field for a proper FPV flight. I wanted to take it nice and easy on my first flight, the idea being to get a feel for how it flies and not make any big moves. I really needn’t have worried though – straight from the off the quad was incredibly stable and silky smooth through the air. Staggeringly smooth in fact, I wasn’t expecting such a nice ride from something that small. Clearly the fact that the 150 is quite a solid and weighty meant it didn’t suffer any lumps and bumps from gusts of wind – it just cut through it. There’s a trade off to this though, go into a full throttle climb out and you’ll notice the weight. Similarly, in fast forward flight, going into a hard 180 degree turn – it’ll take a little time to overcome that inertia and get back up to speed Not that it’s not quick, it’s just on the rocket ship scale that a 250 sized quad swinging higher pitch 5” props will do. With that said though, it should be noted that with the 850mah 4s lipo, I’m on the heaviest recommended setup. Running a lighter 500mah battery means you’d increase the performance and agility – but obviously reduce your flight time. A special mention must go to the camera this quad is equipped with. ImmersionRC have made their OSD software interface with the cameras settings so it can be completely customised via your radio. 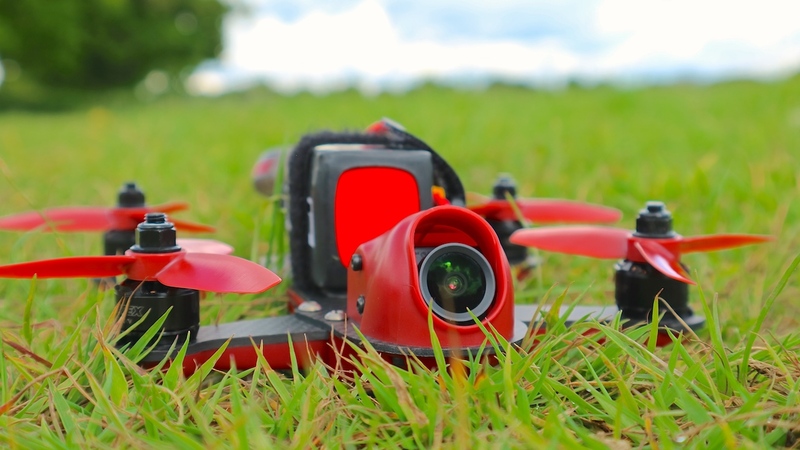 It’s also equipped with a GoPro style lens which produces an absolutely gorgeous FPV feed. Loosening two screws allows you to easy change your tilt angle if you want to fly very fast, or move it back near level if you are having problems coming into land. And this quad will go fast – even cruising, the 150 screams along at quite a pace. Push the throttle all the way and it’s crazy fast. 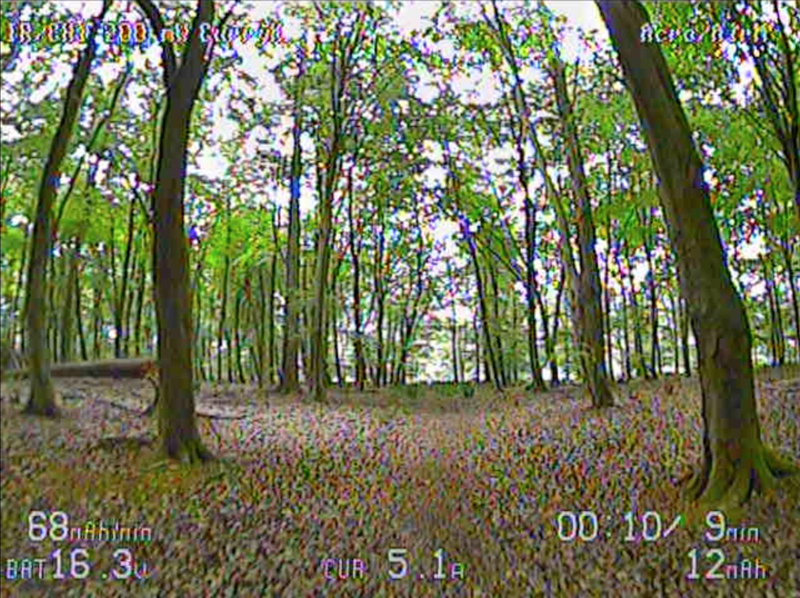 Of course, really pushing the speed drains the lipos all that faster – but I was getting between 3 and 4 minutes out of the 850mah lipos doing some mixed freestyle flying. Having flown a few packs, I can say that the default PIDs felt pretty solid. I thought that the Vortex was a little “loose” in the turns, and for me the yaw rate and to a lesser extent the roll rate needed to be bumped up. This is easily done via the OSD (or by connecting up to Betaflight on the PC) but I thought I would try out the Vortex’s two “pro-tunes” that are available. These two tunes come from Chad Nowak – better know as FinalGlideAUS on YouTube and member of Rotor Riot. There’s a beginner, and expert tune available, so using the OSD I kept the default as profile 1, loaded the beginner tune as profile 2 and the expert as profile 3. I ran into an issue here because of the little changes the the Vortex has interfacing to Betaflight. I’d normally use a stick command to choose a profile (left stick down/left and right stick left for profile 1, up for profile 2 and right for profile 3) This didn’t do anything on the Vortex.. except go back into the OSD menu. After a bit of head-scratching, I eventually found that you set your active profile from the OSD PID tuning menu. The expert tune was a lot more responsive, and the quad felt more locked-in. It sorted my issues I had with the yaw and roll rate, and if anything I’d want to tame the pitch rate down a touch. But this is the great thing about the pro-tunes. Once loaded as a profile, you can use them as a base for tuning to your own flying style and save them – but you can still restore this back to the original pro-tune if you so desire. One of the features the Vortex 150 I wasn’t able to try was it’s integrated Touch’n’Race system. There’s an NFC antenna buried in the side of the Vortex 150 which allows ImmersionRC’s Touch’n’Race wand to be waved over the Vortex in order to set your VTX band, channel and power output. 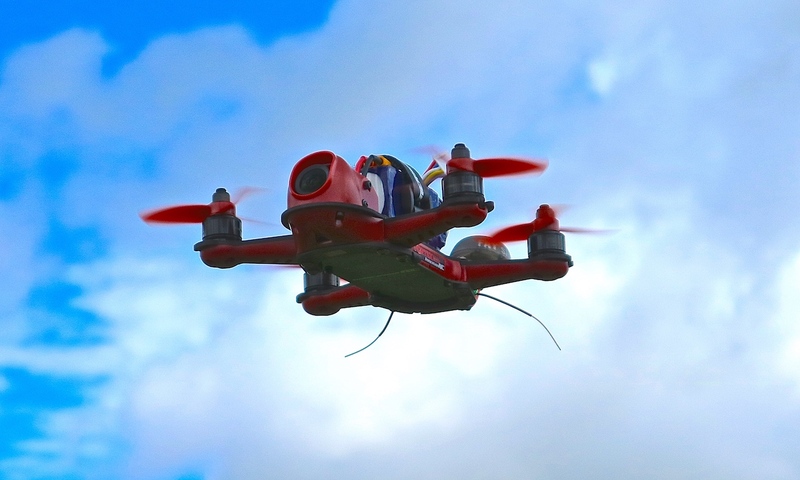 Perfect at a race event, when you need to be certain that powering up to set your model to your assigned video frequency isn’t going to ruin someones day who’s already in the air. 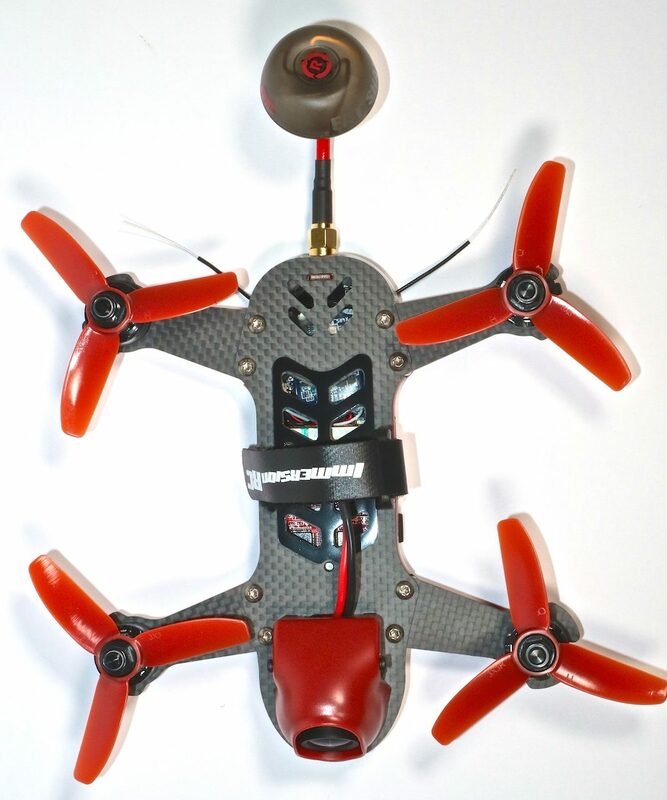 But is a 150mm quad with 3” props a viable racing machine ? Well, yes and no. On long fast tracks the Vortex will be left behind the pack of 5” racers, but in indoor races or small and compact outdoor tracks it does much better. The Vortex can, and has won indoor events in ImmersionRC’s native Holland. Using a lighter 500mah 4s setup, coupled with some 4-bladed props for a little added pep it’s able to outpace more powerful 5” setups around a tight course. I’ve been flying the Vortex over the course of the last few weeks as much as I can. I’ve flown it in sunny weather, gloomy clouds, in some quite dark woods and the camera picture is always wonderful. I’ve found it amazing fun to fly, behaving just as it should, in turn making the flying aspect very easy. It’s overall performance is very impressive, but it’s versatility stands out – you can fly the Vortex 150 almost anywhere. It can go very quickly indeed, whilst having the agility to steer between trees, and freestyle like the best of them (except it can squeeze though even smaller gaps) The fact it’s been so hassle free – needing no build or tuning has made the whole experience a joy. It’s very tough as well – I flew head-on into a tree trunk at some speed. It imagined walking over to find a pile of electrical components spread around. Instead the only damage was one bent prop and a broken battery strap. So who is this quad made for ? The really good news here, is this can be flown by a beginner and it will grow with the pilots experience. If you put a 3s lipo on board, set it to the easy profile in angle mode, then the Vortex 150 behaves like a friendly puppy. 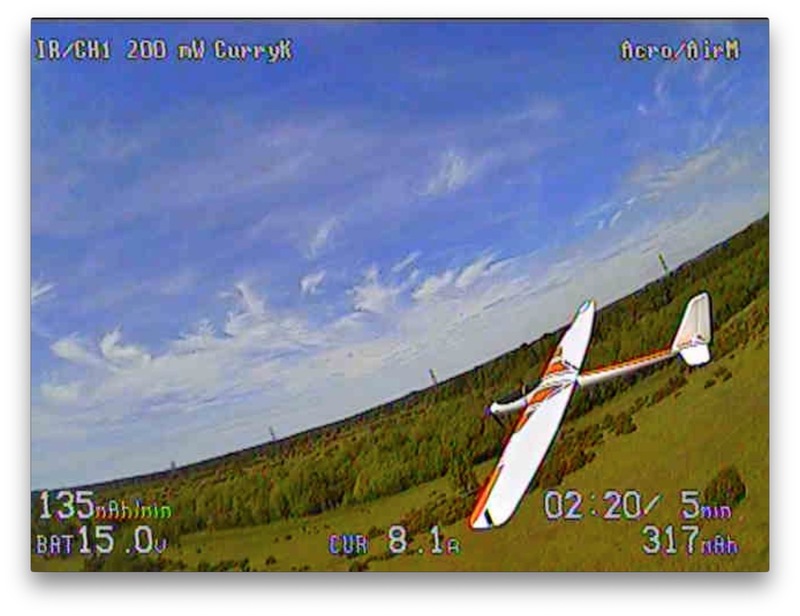 As you improve, you can move to acro flying, then as you start wanting more from it – add in a 4s lipo, bump up the super rates in the PID tuning and you can really let loose with it. Certainly you pay a premium price over constructing your own machine, but with the Vortex 150, it’s more than simply someone doing the build work for you. The huge amount of custom design, and software development involved coupled with the predictable performance and no-hassle setup makes this quad well worth the money.